.... It's an America that remains the most religious country in the developed world, as God-besotted today as ever; a place where Jesus Christ is an obsession, God's favor a birthright, and spiritual knowledge an all-consuming goal. But it's also a place where traditional Christian teachings have been warped into justifications for solipsism and anti-intellectualism, jingoism and utopianism, selfishness and greed. In this America, the ancient Christian teaching that the Scriptures are simultaneously divinely inspired and open to multiple interpretations has become an either/or choice instead. You're either a rigid fundamentalist who believes that dinosaurs just missed hitching a ride on Noah's Ark, or a self-consciously progressive believer for whom the Bible is a kind of refrigerator magnet poetry, awaiting rearrangement by more enlightened minds. As a result, the Jesus of the New Testament, whose paradoxical mix of qualities and commandments presents a challenge to every ideology and faction, has been replaced in the hearts and minds of many Americans with a more congenial figure—a "choose your own Jesus" who better fits their own preconceptions about what a savior should and shouldn't be. Likewise, in this America the traditional Christian attempt to balance the belief that God desires human happiness with the reality of human suffering has been transformed into the simpler teaching that God wants everyone to get rich—that your house or car or high-paying job was intended for you from before the foundation of the world, and that the test of true faith is the rewards that it reaps for believers here on earth. 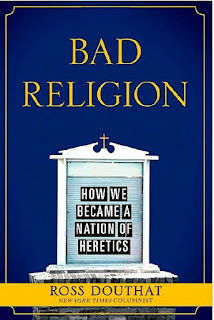 The result is a country where religion actively encourages the sort of recklessness that produced our current economic meltdown, rather than serving as a brake on materialism and a rebuke to avarice. In this America, too, the Christian teaching that every human soul is unique and precious has been stressed, by the prophets of self-fulfillment and gurus of self-love, at the expense of the equally important teaching that every human soul is fatally corrupted by original sin. Absent the latter emphasis, religion becomes a license for egotism and selfishness, easily employed to justify what used to be considered deadly sins. The result is a society where pride becomes "healthy self-esteem," vanity becomes "self-improvement," adultery becomes "following your heart," greed and gluttony become "living the American dream." Finally, in this America the Christian view that God desires justice but that it's wrong to expect utopia in this lifetime has given way to a more optimistic vision, in which the spread of democracy is part of the divine plan, the doctrine of American exceptionalism is a kind of Eleventh Commandment, and political leaders are expected to achieve an approximation of heaven here on earth. The results: an overreaching foreign policy under both Republicans and Democrats, a domestic government that tries to be all things to all people no matter which party is in power, and a polarized mood in which the two political coalitions oscillate between messianic delusions and apocalyptic fears depending on whether or not they control the levers of government. 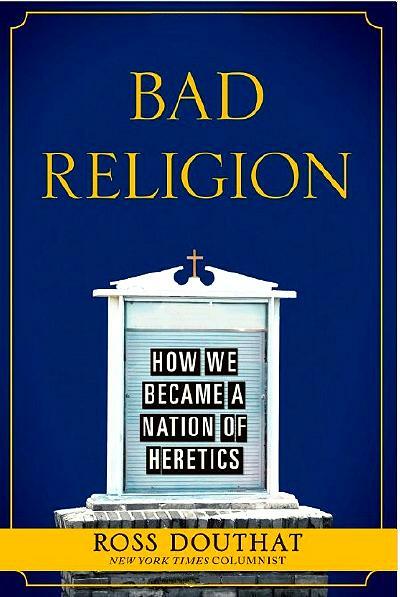 Ross Douthat, Bad Religion: How We Became a Nation of Heretics , 2012.